Inevitably I'm accumulating items that are surplus to my needs. I don't like throwing things away as they are often irreplaceable, even if I don't want them. So I have put them on the following pages with the hope that they will be of use to someone else and maybe keep another item of equipment in service. 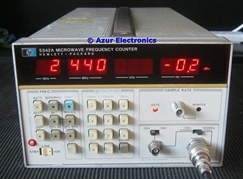 Often my equipment for sale has been part of a 'job lot' of test equipment that I have bought. Sometimes I have bought equipment for a specific purpose and have completed the project so no longer need it. I try and have a 'Spring Clear Out' of surplus equipment every year otherwise I will run out of space in my Workshop! This list of items for sale keeps changing as items are added or sold. If you are interested in anything, please Contact Me. I'm not trying to run a business, rather to just contribute something to the cost of my electronics hobby and cover any shipping expenses! I am based in the UK and ship World-wide. Payment can be made via PayPal.